Dating back to the 1930s, Massachusetts' Springfield Ski Club has the distinction of being the longest continually operating ski club in the country. The origins of the Springfield Ski Club date back to 1933, when Ken Cuddaback and Charlie Parker sought folks with similar recreational interests via a newspaper ad. That winter, the group started looking for a place to develop a ski area. While they initially looked into Mt. Toby to the north, their sights eventually were set to the west of the city. 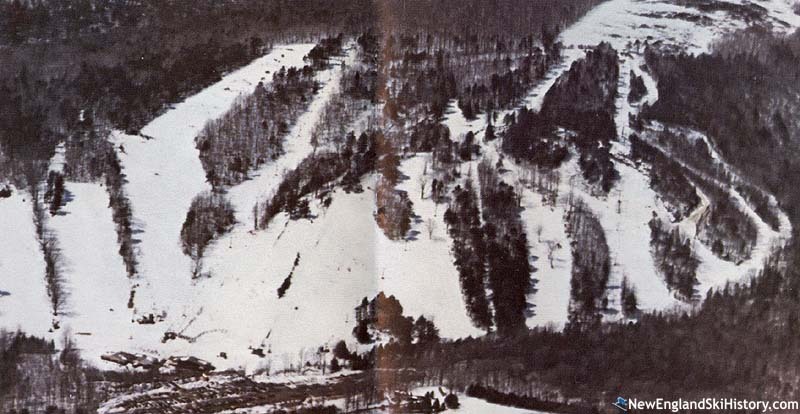 In the fall of 1936, the club was able to obtain permission to develop a ski slope on Pere Persson's farm. Serving the slope was a 1,000 foot long electric rope tow. A nearby schoolhouse was used as a warming hut. Circa 1941, the club purchased the land from the Persson family, firmly establishing Blandford's future. While additional slopes were added after the initial season, the 1,000 rope tow remained the main lift for quite some time. Blandford grew in popularity in the 1950s and 1960s, eventually expanding to 7 rope tows. By the middle of the decade, some 5,000 folks were members of the club, making it more than triple its size in 1941. While Blandford was a popular area near a city, things were changing all around it. In the 1950s, the Massachusetts Turnpike was developed west of Springfield, passing just above the top of Blandford ski area. Later that decade, and into the 1960s, Interstate 91 was built, providing easy access to ski areas up north. Meanwhile, sizable chairlift served ski areas such as Berkshire East, Brodie, Butternut, Catamount, Jiminy Peak, and Mt. Tom were popping up across Western Massachusetts. Not to be left behind, Blandford installed its first double chairlift in 1969. A new Hall brand lift, the Glade chair provided easy access to 450 vertical feet. The building phase continued at Blandford throughout the 1970s. The early 1970s saw the installation of two lifts adjacent to the base area, the Broadway double chairlift and the Broadway T-Bar. Near the end of the decade, the North double chairlift was added, helping to distribute skier traffic while also catering to experts. While ski areas across the state started to disappear, Blandford stayed in operation, thanks in large part to the countless hours of volunteer work its members contributed. After Mt. Tom closed in 1998, Blandford put lights on the Broadway and Schoolhouse slopes to guage support in after school programs. The demand was indeed there, resulting in the expansion of night skiing operations thereafter. As the years passed, infrastructure aged, debt mounted, and membership declined, resulting in financial insolvency in 2017. As a result, the Springfield Ski Club sold to the ownership of Ski Butternut in September of 2017. 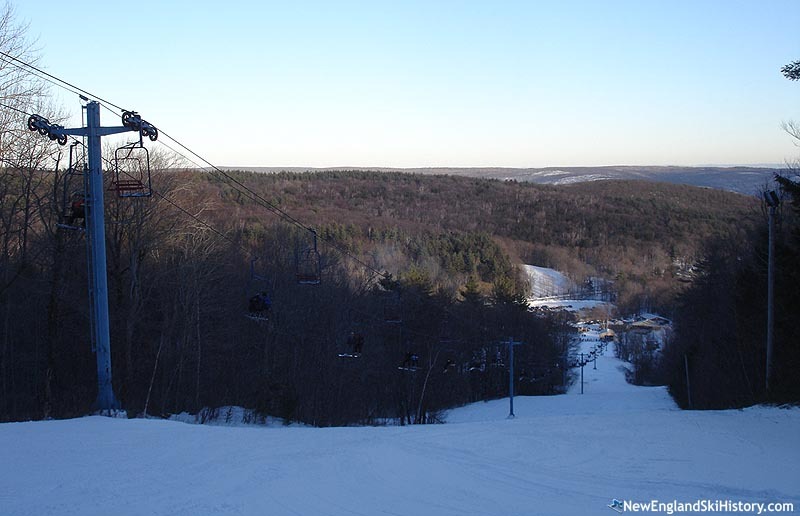 Blandford is the only remaining alpine ski area in Hampden County. "My parents were skiing there in the 40’s and were part of the Springfield Ski Club when it was run by the members . There were many families from Holyoke who were members around the same years. I started skiing when I was 3 years old and my brother and I raced there for many years. I love Blandford and loved the rope tows. Many found memories of Blandford. " "1947 in backpack with Mother. Many great winters here." 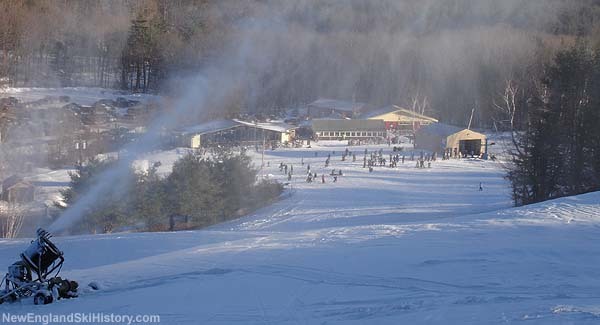 "This was my first 'Big' ski area after learning in Southwick and Pawatuck in the late 60's. I remember seeing the very first of the snow boarders here which was called 'Snurfing' back then. This was the single board with a rope at the tip the rider would hold onto. They were not allowed except for very late in the day on Sunday when most ski traffic was done. Glad to hear it still thrives!" "began skiing here as a kid around 1966 or' '67. Many scary belly flops trying to learn to ride a rope tow there and thought all the high school kids with those metal tow clips on their belts were so cool. Never could get close to the big fireplace in original lodge, too crowded. Everyone would take off their boots and line them up by the fire to warm up and dry out - back in the days of lace ups!" "My family started skiing Blandford in the mid 60's and we would ski with other families in the neighborhood for the next 15 years. I have such fond memories of riding all the rope tows (using row 'grippers') all day long. It was during these years that I became hooked on the skiing lifestyle. I have worked as the director of engineering for Jackson Hole for over 25 years now and have contributed in creating one of the best ski resorts in the world. Thanks Blandford! " "I spent many winter days skiing Blandford from the time I was twelve years old. I learned to ski there, as well as my son and my grandson. It is really a family oriented area. I have many fond memories of the work parties in the fall back in the 60s. We all had fun and we got alot of work done. " "This was my great grandfather's farm. My Dad learned to ski here and became a member of the National Ski patrol. He's stil alive at 88."